As hardware and software products mature, more and more features seem to seep into them. This trend is definitely manifesting in many of the 2011 HDTVs. With cross pollination from computers, tablets, and smartphones, the feature creep in TVs is most evident in the extras and apps that are populating Internet connected TVs. Of course, one person's clutter is another's treasure. And for those suckled on the ever expanding flow of tablet and smartphone apps, the stream of TV apps seems like a trickle. With their new offerings, TV makers are performing a tricky balancing act. On one end, the designers are transforming the TV into a large screen tablet with apps and home networking capabilities. On the other side of the scales, manufacturers must provide an easy to use television for their more stodgy customers. With the LW5600 series, the LG designers have succeeded in offering a wide range of features for the tech savvy crowd while keeping the basic setup and operation of the TV simple enough for the "just the facts, ma'am" generation. And, oh by the way, the edge-lit LED LW5600 produces some of the best 3D Picture Quality (PQ) that I have encountered. Add to that, LG's 3D technology uses the less expensive and less intrusive passive 3D glasses. All together, with the LW5600 series, LG has created a winning combination of a high performing 3D - and 2D - TV with a host of top-end features. 2D PQ is solid. Playback of 3D Blu-rays from this passive glasses system is top notch. As a bonus, the LW5600's 2D to 3D conversion of still images can be impressive. But don't expect the same from the conversion of 2D movies. Audio quality from the standard 10W speakers is adequate for TV viewing. LG supplies the usual suspects of Internet heavy hitters like Netflix, Facebook and Napster. Wi-Fi is not built-in, but a plug-in adapter is packed in the box. 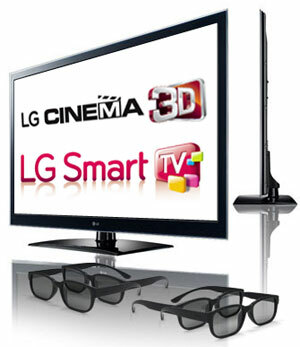 LG also includes four sets of 3D glasses and the very handy Magic Wand. Setting up the display is made effortless with LG's Picture Wizard. Accessing some of the offerings on their Smart TV feature is not as painless, but working through the process can be rewarding. At the time of this review, the LG site lists the 47LW5600 at $1699, which is a competitive price for an edge-lit LED 3D TV with all of its features and performance. But a search on the Internet yields a price up to $600 less, which makes this an irresistible value if you are looking to enter the world of 3D TVs. Ratings are relative to when the review was written. The obvious example is Value, what you could purchase for $2000 two years ago or even two months ago would seem like a bad value for that price now. We have give very few 5 Star ratings, which we reserve for truly outstanding accomplishment. All things being equal (including price), which is the better overall TV and value -- the Panasonic TC-P50GT30 or the LG 47LW5600?